More and more of us are wanting to take indoor living outdoors, but we don’t want to spend a lot of money to have an outdoor space created nor to keep it in tip top condition. Above all, we want it to be something that friends and neighbours will envy. Well, composite decking is an affordable, maintenance-free and envy-causing solution. Forget your hardwood decking with its tendency to split and warp and the need to protect and preserve it. You get none of this with composite decking. It’s made from a variety of materials, hence ‘composite’, and most of these are man-made. 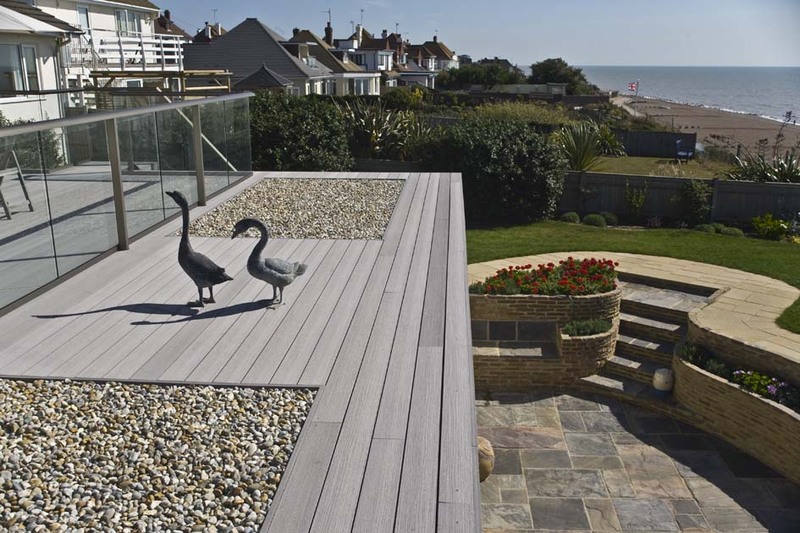 It looks expensive, certainly has the ‘wow’ factor, but will cost you a fraction of that for traditional decking. It is also easy to fit yourself and comes in all sorts of colours and finishes. It’s much easier to work with, too, which means that it can be used in a number of situations to enhance or compliment your outdoor spaces. Understandably, most people will use it to create a standard patio, but what about that flat roof with a view? And then there’s that tree you’ve always felt was a feature but needed ‘something else’; or the area at the bottom of the garden which is a bit of a wilderness but you always thought could be made into a useable space. Composite decking will work for all these. The beauty about composite decking is that it doesn’t weigh as much as hardwood decking. So for turning a flat roof into a veranda it’s perfect as it won’t cause any structural issues. And if the roof is over a bedroom or living area there is a number of composite decking products that have sound-deadening properties. The tree that needs that ‘something’. How about a circular deck with space for seating? Or, for a feature which is becoming more popular, what about a ‘floating’ deck, which literally gives one the impression that the deck is floating above the ground. That wilderness area can be transformed, too. Keeping with the circular theme, think about making a firepit the focus. After all, there’s nothing like settling down in front of a fire as the temperature drops and the night draws in. So, as you can see, there are numerous ways in which composite decking can work to make your outdoor spaces more appealing and useful. And don’t just think grand, or large, but also consider using composite decking for paths and walkways, or steps between different levels. Whatever project you have in mind, you’ve now got another product you can add to your thinking.